SIC if anyone sees the remote loop at taobao ok ? They will give u siri but whether it works is another qn. 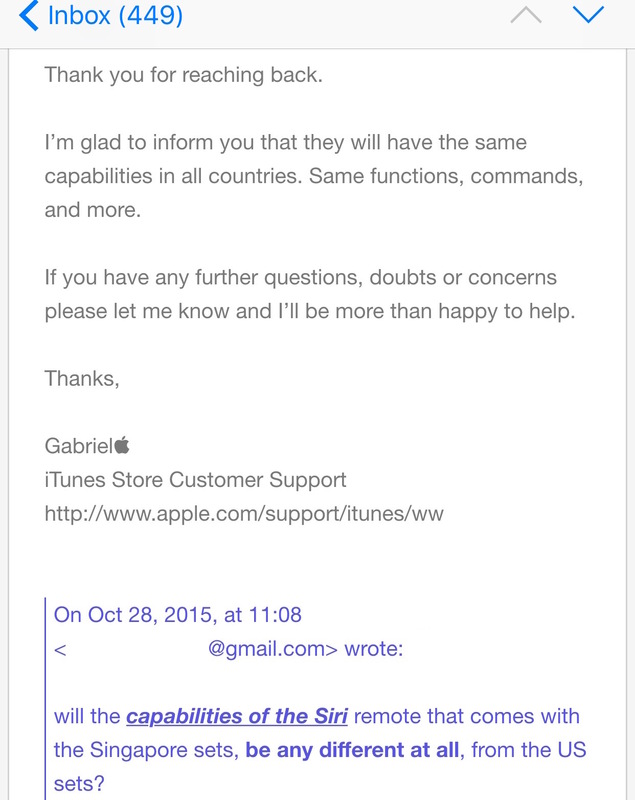 Actually, I didn't follow the keynote announcement; so if anything Siri function is missing, I also won't know. Just ordered, 3rd nov delivery. Lets just wait for local review 1st.... that's most important now. if review say bad, then wait for ATV5? My order changed to Preparing for Shipment yesterday! Can't wait. ordered, on 27th lunch time.... if not, i think will receive earlier. Yup, can't wait for it to arrive! I believe Siri on Apple TV should be able to recognize Singapore English like the one on iOS? U mean the iOS on iPhone? I always speak to Siri when driving one lo. Siri not localized enough, if you ask me.